DairyDepot.com, Alta Dena Dairy Delivery,California Milk & Ice Cream Wholesale Distributer. Welcome to Dairy Depot Inc. If you’re looking for a high quality product at a competitive price, low cost alternatives and a selective product line with specific needs for your customers, you have come to the right place. At Dairy Depot, we strive to offer superior service and give you the attention and customer service you’ll come to expect and enjoy. We offer the best product line when it comes to health and nutrition. 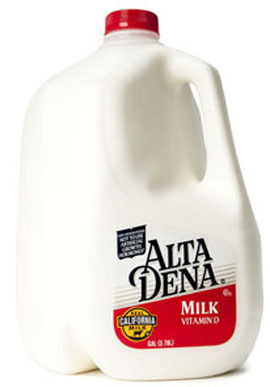 As Alta Dena Dairy's #1 Authorized Distributor and located in house our milk has a longer shelf life than our competitors. We also offer other than Alta Dena products like Swiss, Knudsen, Horizon, Silk, Dairy Ease, Bakers Topping, Dairy Gold, Yo-plait, Chobani, Nesquick, International Delight, Tropicana, Naked, Tampico, Tru-Moo, Miss Karen's, Joy, J.H.S, Good Humor, Dove, Ben&Jerry's, Breyer's, Thrifty, Rainbows End, and much more. We can also accommodate potential customers with a Glass display refrigerator ice cream novelty freezer. We are a fmaily owned and operated business located in City Of Industry CA since 1970. Let us put our experience to work for you.